Real-estate developers from Phoenix to Washington, D.C., are suggesting former shopping malls as prime locations for Amazon’s next headquarters. Amazon will have plenty of options when it picks the site for its second headquarters, and in an ironic twist for a company that helped introduce the world to online retail, a few of those options may be defunct shopping malls. 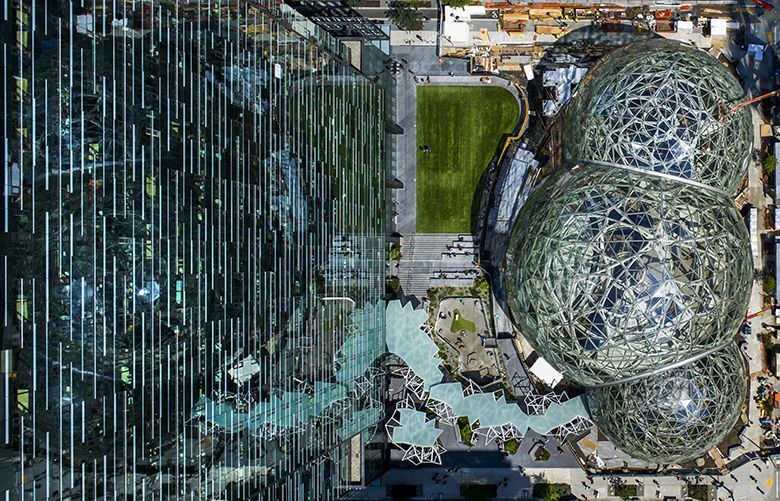 Real-estate developers from Phoenix to Washington, D.C., are suggesting former temples of American commerce as prime locations for Amazon’s next headquarters. The proposition makes some sense. Shopping malls can be massive, big enough on their own to meet the space requirements Amazon laid out for its second home. They also tend to be located within reach of the highways, population centers and airports that Amazon mentioned in its wish list of characteristics for what it calls HQ2. Another advantage: easy availability. Increasingly, malls are vacant. The last few years have been awful for brick-and-mortar retail. After overly ambitious store building and borrowing during the pre-recession boom years, and amid a generational shift to online purchases, retailers have been shuttering stores at a record clip. That’s laid low many of the malls that house them. Oliver Chen, who tracks retail for Cowen & Co., said he expects the closure of 20 percent of the roughly 1,200 U.S. shopping malls currently operating. The decline of the shopping mall has become a media theme, the stuff of lengthy obituaries and more than one amateur documentarian who broadcasts tours of the ruins. (“These are the ruins of a dying culture,” one CBS reporter intones over footage of a demolition). After Amazon’s September announcement that it was hunting for a second home in a North American city, seeking an initial 500,000 square feet by 2019, developers saw an opportunity to make use of former malls. Those sites have been popular conversation topics as cities and states cobble together bids before Amazon’s Oct. 19 HQ2 deadline. One plan being floated for the Dallas area would make the site of the nearly vacant Valley View Mall the cornerstone of an up to 400-acre development built around Amazon. A 20-acre “Amazon park” would sit in the middle. (At another corner: the still-operating Galleria Dallas mall). Developers in suburban Phoenix and Detroit similarly hope that Amazon will make use of land now occupied by vacant stores. And in Pittsburgh, a few minutes’ drive from downtown on Interstate 376, sits the site of the former Parkway Center Mall. The mall opened in 1982, in the heart of a boom that saw 1,500 shopping centers built in the 50 years after the construction of the first modern, enclosed shopping mall in 1956. Parkway Center had struggled before the rise of online commerce. Competition from other shopping districts drew away some stores. A face-lift in the 1990s helped, but more tenants went under or departed in the 2000s. The former food-court space was leased to a dance studio and state driver’s license facility. Another floor was shuttered entirely. By the time Kmart left in 2013, the mall was left with one anchor tenant: a Giant Eagle supermarket. The mall’s owner, Kossman Development, last year opted to demolish everything except the supermarket. “The mall, for a variety of reasons, fell out of favor,” said Curtis Kossman, president of the company. People want to shop in areas that include restaurants, living space, areas that give more of a sense of community than plain storefronts, he said. Kossman, a third-generation developer, had his sights set on a mixed commercial and residential rebuild when Amazon announced last month that it was seeking a second headquarters. 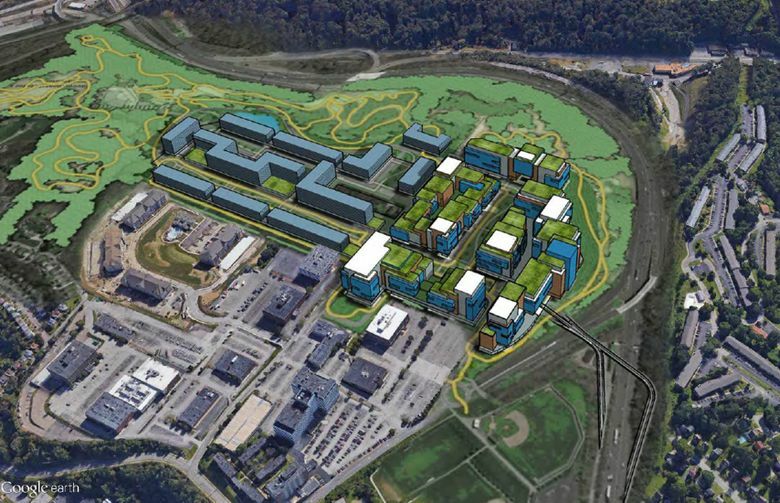 He modified those plans to suit the retail giant, and last week submitted his pitch to the committee coordinating the Pittsburgh area’s bid. The old mall site and some adjacent land, about 35 acres, would be redeveloped into up to 5.4 million square feet of office space, atop an underground structure for 19,135 parking spaces. An adjacent, 65-acre parcel would be set aside for mixed-use development. The whole campus would be ringed by green space and bicycle paths. And interspersed around the buildings: 680,000 square feet of retail space.